Before and McAfter » James Betelle, Where Are You? Guilbert & Betelle designed a number of banks for Newark in the early 1920s. They are frustratingly difficult to track down, because few reveal their addresses, or are probably drastically altered in appearance. 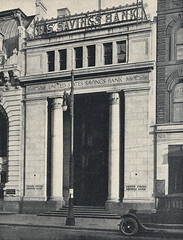 Well this one, the United States Savings Bank on Broad Street, still exists. 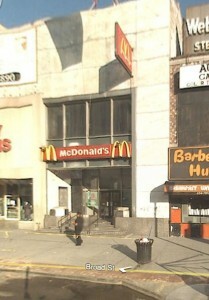 I’ve unknowingly walked past it dozens of times, because it was now a generic, yucky McDonalds*. In fact, it’s just around the corner from Betelle’s old office in the Chamber of Commerce Building on Branford Place. I would never have given it a second glance. I was able to identify the building thanks to a volume of The American Architect magazine from 1924, which contains a number of excellent spreads on Betelle banks (still working on ID’ing those…). A quick search revealed the address of the USSB, which apparently moved out in 1982—a pretty good run, really. The original lot was long and narrow, but clean lines and a simple pair of Corinthian columns gave the building a strong, noble presence. The theatrical sign on the roof was certainly a unique touch for a bank (influenced perhaps by the wealth of nearby theaters), but doesn’t detract from the design. The transformation from bank to McDonalds is startling—the columns were un-ceremoniously chopped out, leaving anachronistic stumps, and the facade was covered with stone panels. The panels continues to the building next door, stripped of what appeared to be a healthy dollop of the Beaux-Arts style. 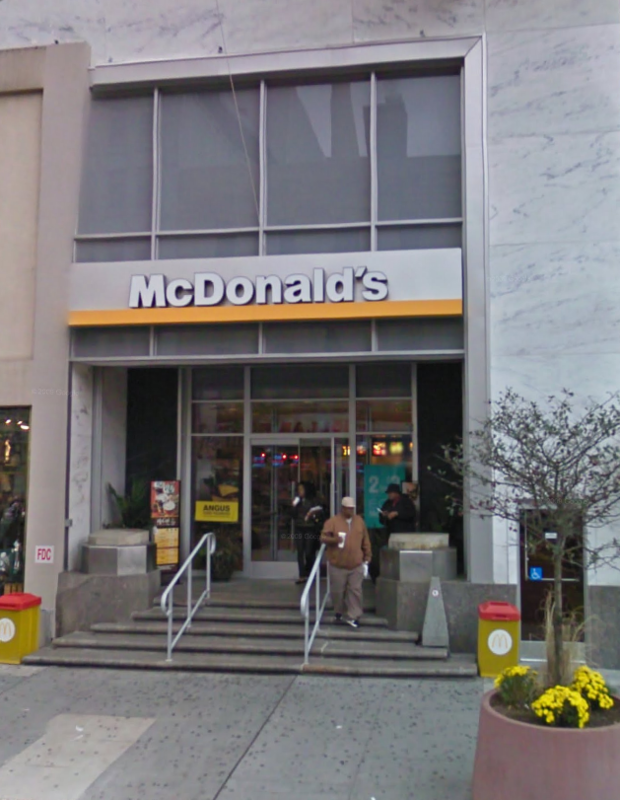 *The Google street view photo above is misleading; The McDonalds recently underwent a $2 million renovation, and seems to look much nicer now. Now if they could just get someone to rip out that McDonald’s, the building might look nice again. Golden Arches for marble columns… I like it!